The plot not only thickens but unfolds in a timely manner. Sherlock Holmes is undoubtedly one of the most recognizable detectives since its creation by the late British author Sir Arthur Conan Doyle back in 1887 with the story “A Study in Scarlet.” Holmes He’s known for smoking his pipe, coming up with far-fetched theories, that somehow ring true, and his attention to detail. It’s both fascinating and annoying simultaneously. In this original production Katie Forgett (Cindy Rella, Everybody’s a Critic) weaved elements of Doyle’s past stories along with her own creativity to create a phenomenal story that Doyle would appreciate. Actress Lily Langtry (a wonderful Melissa Collins) is being blackmailed and seeks the help of Sherlock Holmes (Martin Thompson). She goes to him in the guise of looking for employment. She brings her best friend, the quick-witted playwright Oscar Wilde (a magnificent job by Scott Facher). Quickly, Holmes perceptive powers go to work. He makes Lily spill the tea on what’s really going on. She explains in blunt detail how she was assaulted in her dressing room after her performance in “Danger.” Some intimate letters were stolen. Watson (John Wallace Combs) dismissed it as “youthful indiscretion,” but it’s not. The doctor is instantly smitten aby the stage actress. After she leaves, Holmes instructs Watson to watch Lily at her home and get ready for his entrance in the house. Further deep in the investigation, Holmes encounters colorful characters, or perhaps suspects, in the case of the missing letters. There’s the surly housekeeper Irma, (Alison Blanchard played it exceptionally)and Professor Moriarty (David Buzzota killed it). Director Jules Aaron (A Shred of Evidence and Rod Sterling’s Patterns) brings out the coolness of this original piece. Everyone shines in their own light and together they excel brightly. Sherlock Holmes is alive and well and doing fantastic. To watch the man work is watching a genius coming into his glory. 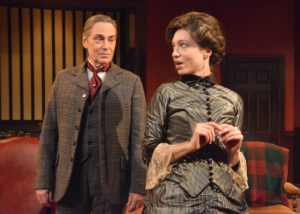 Sherlock Holmes and the Case of the Jersey Lily ends Sunday, December 17 at 2 p.m. Friday the 15th and Saturday the 16th at 8 p.m. playing at Theatre 40, located at 241 S. Moreno Drive in Beverly Hills. For ticket information, call (310) 364-0535 or reserve online at www.theatre40.org. • The inspiration for the character stems from several fictional characters. Most notably is Edgar Allan Poe’s character, C. Auguste Dupin from “The Murders in the Rue Morgue” (1841), “The Mystery of Marie Rogêt” (1842) and “The Purloined Letter” (1844). • Doyle credits Dr. Joseph Bell, a surgeon who could deduce huge conclusions into shorter details. • Holmes was a detective for 23 years. • Doyle killed Holmes in “The Final Problem” (1893) but resurrected him in “The Hound of the Baskervilles,”(1902) after receiving pressure to bring the character back to life. • Holmes injected cocaine and used morphine. As a doctor, Watson disapproved but says it’s Holmes only vice. • The closest Holmes comes in saying the famous, “Elementary, my dear Watson,” was in “The Adventure of the Crooked Man” Holmes says “Elementary” and “my dear Watson,” but not together.